Fibergrate fiberglass grating was installed for walking platforms to provide a secure walking surface when wet, while both fiberglass railing and structural supports were built into the treatment facility for added safety. Stainless steel was originally specified for swirl concentrators. However, the fiberglass concentrators designed were resistant to the corrosive effects of wastewater treatment plants and were able to resist material buildup. Superior characteristics of Fibergrate's fiberglass products eliminate the need for maintenance and provide for years of trouble-free service. 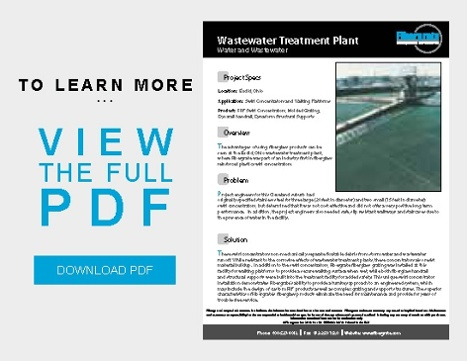 The advantages of using fiberglass products can be seen at the Euclid, Ohio wastewater treatment plant, where Fibergrate was part of an industry first in fiberglass swirl concentrators. Project engineers for this Cleveland suburb had originally specified stainless steel for three large (30 feet in diameter) and two small (15 feet in diameter) swirl concentrators, but determined that it was not cost effective and did not offer a very positive long term performance. In addition, the project engineers also needed safe, slip resistant walkways and staircases due to the presence of water in the facility. These swirl concentrators non-mechanically separate floatable debris from storm water and wastewater runoff. While resistant to the corrosive effects of wastewater treatment plants, these concentrators also resist material buildup. In addition to the swirl concentrators, Fibergrate fiberglass grating was installed at this facility for walking platforms to provide a secure walking surface when wet, while both fiberglass railing and structural supports were built into the treatment facility for added safety. This unique swirl concentrator installation demonstrates Fibergrate's ability to provide a turnkey approach to an engineered system, which may include the design of custom FRP products as well as complex grating and support structures. The superior characteristics of Fibergrate's fiberglass products eliminate the need for maintenance and provide for years of trouble-free service.